Cooking with children is a wonderful way to expose them to important maths concepts. The passage of time is an abstract concept that's sometimes very difficult for young minds to grasp. But waiting for the turkey to come out of the oven on Thanksgiving is a concretely yummy experience! Sit with your child and explain that you're going to create an itinerary for Thanksgiving dinner! Help your child look up cooking times and temperature For your size turkey on the Internet or in a cookbook. Have her help decide when you will want to eat. Then, challenge her to figure out when will you need to start the turkey, referring to the cooking times and turkey size. Let your child become the official time keeper as the turkey roasts. 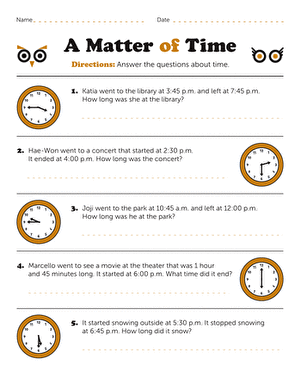 Explain to your child that the short hand on an analog clock shows the hours, whereas the long hand shows the minutes. Remind her that there are exactly sixty minutes in an hour. Explain that each time the minute hand goes around, an hour has passed. 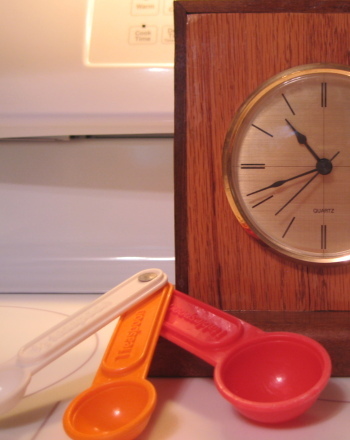 Review how to set a digital timer, or use a more traditional kitchen timer. As you slide the prepared turkey into the oven, have your child start the timer and check the time on the analog clock. Periodically throughout the duration of the roast, ask your child how much time has passed and how much time remains until the turkey is fully cooked. Each time you ask the official cook time, have her first report the hours, then the minutes, and finally seconds that the turkey has been roasting. In addition, have her report how much time remains until the Thanksgiving turkey is done. Have her enjoy the fruits of your collective labor. As an added bonus, we can almost guarantee your bird won't be overcooked this year. 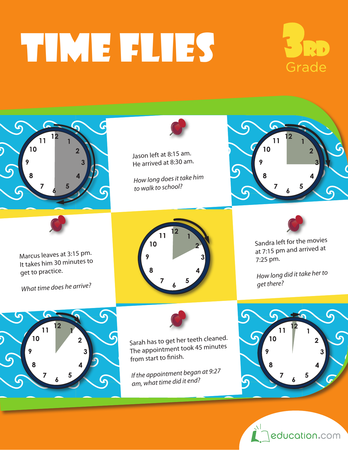 Learn time words and phrases and what they mean with this vocabulary sheet that helps students successfully tell time. 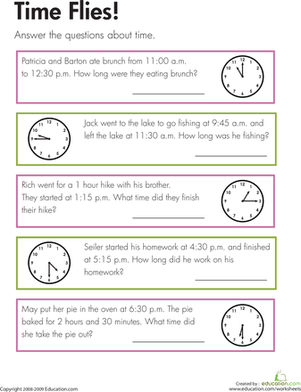 Use this resource with your students to practise solving elapsed time word problems using subtraction. 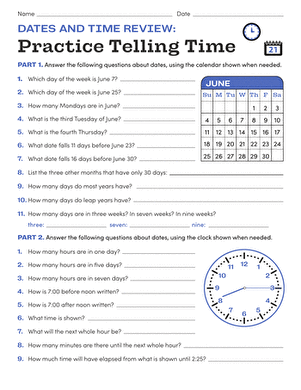 Use this resource with your students to practise solving elapsed time word problems using addition. It's time to calculate.. time! 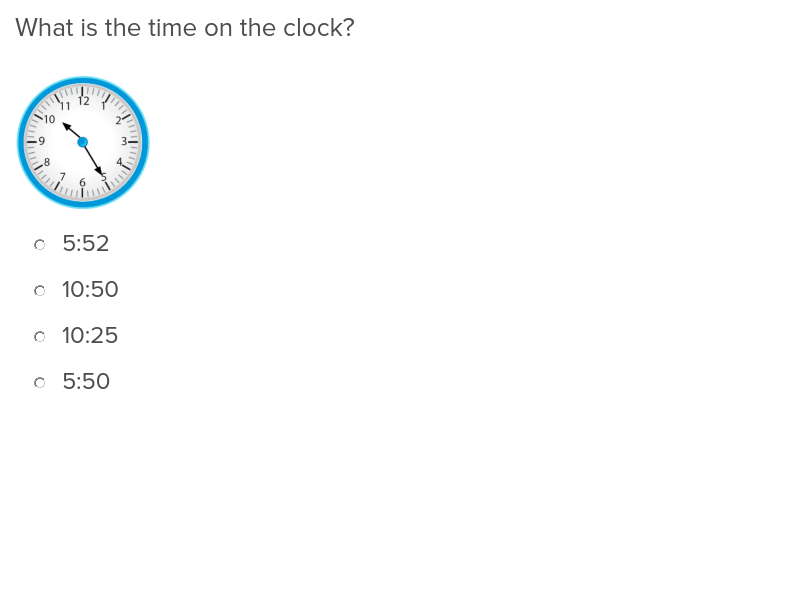 In this exercise your class will use a number line to add and subtract time.